I mentioned in a previous post that my son, Scott, had an independent living skills class all through homeschool high school. One of the things he learned is what is necessary to a recipe and what can be changed to make up a new recipe. 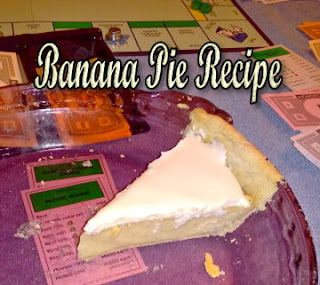 Not long ago, Scott decided he wanted a banana pie, but not a banana cream pie. He came up with the following recipe that is really good. Not too sweet, and not too rich, but just sweet enough. The texture is a little like the texture of a traditional pumpkin pie, but the flavor is definitely banana! Christmas Day, he made two of these pies. There were seven of us there, and after pie was served, it didn't take long for everyone to request seconds. In no time at all, the pies were gone. We played Monopoly for hours. When the pie was ready to slice, Jesse, my grandson, couldn't wait for his slice. The game was put on hold while everyone enjoyed the pie. Scott has graciously shared the recipe with me, so that I can share it with you. Enjoy! 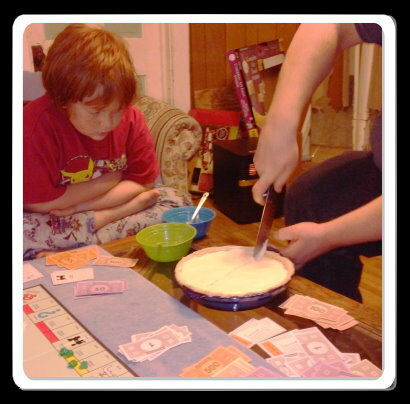 Jesse ignores Monopoly until after the pie is served. Blend it all smooth and place into two unbaked pie crusts. Bake for 40 minutes on 350 degrees, then cool for 20 minutes. Chill for 1 hour. Before serving, top with Banana Whipped Cream or Cool Whip. Note: For deep dish pie plates, add two additional bananas. Whip with immersion blender or mixer till stiff peaks form. Top the pies, slice and serve. Sound delicious. Can't wait to try it.